Was the Real Wild West one of “Institutional Entrepreneurs”? I don’t read much lately, but my more libertarian daughter listens to Hoover & Cato podcasts. She mentioned one on The Not So Wild, Wild West: Property Rights on the Frontier So I ordered the book. I don’t know much about economics but have come to admire economists because they so aptly describe human nature, and often give arguments for wise institutions. The authors argue that “entrepreneurs of institutions” helped make life relatively orderly on the frontier. For instance, one maximized the profits and minimized the costs by ensuring Abilene was railhead, where the cowboys ended their long contracts of driving the cattle and the railroads took them east. But often it wasn’t a “middleman” as much as the consensus of a group, as they set out in wagon trains or obtained mining rights. I commented in this post about the consumerist fog that in which I was living as a middle-rank American military officer, and my desire to “fix” or improve my situation by taking command of my finances. It was simple, but not easy. Who is giving Apple legal advice? The government is asking Apple to give it the password to Syed Rizwan Farook’s iPhone and iCloud account. Apple is refusing to do so based on its First Amendment rights. This seems to me to be a very weak argument. Just ask Judith Miller. And there really is very little difference. Apple will have to spend $100,000 to comply and all Judith Miller needed to do was name a source. But Apple’s case involves a national security threat to each and every American whereas Judith Miller’s involved only an implausible threat to Valerie Plame who chose to garner all kinds of media attention thereafter. If there were a safe deposit box the government wanted opened, it would go to a court and get an order for the bank to drill the locks out so that the box could be removed. The bank would comply. Apple will lose. And if Apple does not lose, the matter will go, as its pleading requests and as it may, even if it loses, now that Apple has made such a ruckus, from the fairly rational precincts of the judiciary to the fully irrational floor of the Congress. Let’s suppose that before legislation is completed there is another domestic terror incident in the US and the terrorist used an Apple iPhone. What kind of legislation would Apple get after that? While not yet widely known, Apple has likely put a back door into every Chinese iPhone via a Chinese designed chip added to the iPhone at China’s insistence for phones sold in the PRC. If this is confirmed, Congress would go even more non-linear. And what other things might the government do if Apple were to prevail? Well, in the extreme it could ask GCHQ or some other foreign service to crack the iPhone in general. No device is uncrackable. It could also signal the Chinese that it would not be aggressive in pursuing IP violations by China in the case of Apple products. Apple is refusing to cooperate with its government in the first responsibility of that government, to protect its citizens. There would be consequences. Is it really good legal advice to let your client take such risks? Apple should have quietly cut a deal with the government that would offer its customers the maximum security and quietly complied with court orders until a truly offensive order was received. Barring that, Apple would have a far better argument saying that ordering it to break its phones would lower their value to customers, lowering Apple’s revenues, and lowering Apple’s market cap. This would constitute an uncompensated taking by the Federal government of enormous monetary value from every Apple shareholder for which Apple should be compensated. Apple will be made out to be protecting the ability of terrorists to communicate in secret. We are at war with these terrorists. They will kill any of us where ever they can. Article III, section 3 of the Constitution states,”Treason against the United States, shall consist only in levying war against them, or in adhering to their enemies, giving them aid and comfort.” That sounds a lot like what Apple is seeking to do under protection of the first amendment’s emanations and penumbras. Tim Cook is engaging in the same kind of magical thinking that has dominated the boomer elite and led to so many tragedies for the last 24 years. Losing wars has consequences. A Preference Cascade is Forming. Glenn Reynolds has known about this for a long time. issues). Such regimes have little legitimacy, but they spend a lot of effort making sure that citizens don’t realize the extent to which their fellow-citizens dislike the regime. If the secret police and the censors are doing their job, 99% of the populace can hate the regime and be ready to revolt against it – but no revolt will occur because no one realizes that everyone else feels the same way. Peggy Noonan has written about it several times. But in my experience any nonpolitical person on the street, when asked who will win, not only knows but gets a look as if you’re teasing him. Trump, they say. This is something I have been looking at for a while. Left-wing people care so deeply that they don’t have time for thinking and convincing. Left-wing activists help other people care on the internet. They are very helpful in pointing out when people have forgotten to show that they care. Could iPhones be built robotically in the USA? What if someone were to apply the computer-controlled logistics system of an Amazon.com type business with robotic manufacturing? At Amazon, parts are stocked and retrieved robotically, inventories are updated, parts ordered, payments made, payments received, all with a minimum of human intervention. Humans manage the system, the system does the grunt work. Everything that can be automated is. Combine that with robotic assembly, robotic inspection, robotic test, robotic packaging and shipping, and it seems one could easily compete with China for manufacturing a product like an iPhone. If something seems obvious yet does not occur, then one has not accounted for some key thing. From my perspective, the key engine of economic growth is manufacturing; taking raw or less valuable material, applying know-how and capability, and creating something with greater net worth than the sum of its raw material worth. It is the foundation of wealth creation. And wealth creation is the foundation of a healthy economy, a high standard of living, social stability and opportunity. Are we so tangled up in taxes and EPA and OSHA regulations we simply cannot manufacture anything competitively in the United States any longer, even with robots? If so, what is the solution, realistically? Is it possible to reform the regulatory state or does it need to be discarded, starting fresh? Can the tax system be fixed or should it burned and rebuilt? What is required to get manufacturing back on track in the United States? Negative Interest Rates! What A Great Idea! TOKYO—Look no further than Japan’s hardware stores for a worrying new sign that consumers are hoarding cash—the opposite of what the Bank of Japan had hoped when it recently introduced negative interest rates. Signs are emerging of higher demand for safes—a place where the interest rate on cash is always zero, no matter what the central bank does. Cash languishing in safes could thwart the Bank of Japan’s move to get money circulating more vigorously in the economy. Shimachu Co., which operates a chain of stores selling hardware and home products, said Monday that sales of safes in the week that ended Sunday were 2½ times higher than in the same period a year earlier. Of course the Fed would never be so foolish as to institute a negative-rates policy in the hope of getting investors to prop up weakening securities markets. Right? I wrote and published this 8-page short story–Purim & My Bangladeshi Friend–a little while back. As I said, today is Purim, and it’s Purim again in a month. So my short story is, I think, once again, timely, and sadly, once again, all too relevant to life in our shared West, in our shared modernity. But despite all the opportunistic campaign rhetoric, the newly elected President Eisenhower more or less followed Truman’s policies. By July 1953 he had achieved an armistice. And by keeping sizable U.S. deployments of peacekeepers in place, he also ensured what would become a long evolution to democracy in South Korea and the country’s current dynamic economy. Had Eisenhower, in Obama-like worry over his 1956 reelection bid, yanked out all U.S. peacekeepers in December 1955, and blamed the resulting debacle on his Democratic predecessor (“Truman’s War”), while writing off the North Korean aggressors as jayvees, we can imagine a quick North Korean absorption of the South, with the sort of death and chaos we are now seeing in Iraq. We can surely argue about Iraq, but we must not airbrush away facts. The mystery of the current Iraq fantasy is not that a prevaricating Donald Trump misrepresents the war in the fashion of Democratic senators and liberal pundits who once eagerly supported it, but that his Republican opponents so easily let him do it. In 2009 news stories reported that fewer Americans had been killed in Iraq the previous year than were murdered in Chicago. Iraq had an imperfect but functioning democratic government. The war was essentially won. In 2016 Iraq has largely fallen apart. ISIS, Iran and Russia dominate much of Iraq and Syria. ISIS controls territory in North Africa. Jordan and Saudi Arabia are hanging by threads. Turkey and Russia have skirmished. Israel no longer has regional air superiority, perhaps not even air superiority in all of its own territory. Talk of regional and even world war is in the air. The principal differences between 2008 and 2016 are Obama’s terrible decisions to withdraw US forces from Iraq and then to stop defending our other Middle Eastern interests. Bush had nothing to do with it except to the extent he was inept at promoting his case at home. Many if not most Americans neither understand why we invaded Iraq nor remember the bi-partisan, international consensus for invasion that existed in 2002 and 2003. I like both Haidt and Foster’s remarks. This is a comment that got out of hand. I would observe that it isn’t like we didn’t know – that we hadn’t been warned. Victimization is of course, more common in a culture of feelings than of thought, of sentimentality than sense. It is old in close knit communities where others can be expected to sympathize (think of the power of the younger, weaker child over an older, stronger sibling in making a case to a parent). I suspect that in the past it has more often characterized a small, closely knit group and the wielders of the power were probably more often women (think especially mothers). The boldness with which women project the claim today probably comes from an assurance that counters the value of the claim itself; we are out of the closet in terms of competitive will but we’ve lost the skill to wield it subtly. As a comment observes, this 21st century feminization of American culture enriches Oprah. But on the founders’ ships, embarking on an adventure in itself signaling virtue, it might have been more powerful if the leaders hadn’t been so aware of human nature and condemned it so clearly. Vote ONLY for someone who has failed and has LEARNED from failure. This limits the field to Trump, Cruz and Carson. In 1861, after Fort Sumter fell, the U.S. Army seized John Merryman, a Maryland citizen and state militia officer, and detained him in Fort McHenry, in Baltimore, Maryland. Merryman’s lawyers sought a writ of habeas corpus. After a hearing, Taney determined that the Army had violated the Constitution by seizing and detaining Merryman absent due process. Taney offered much flowing language—the sort which endears him to do-gooders and starry-eyed civil libertarians. But that is all that Taney did: He offered pieties in a judicial opinion. The reality is that Taney did not grant Merryman habeas corpus. In other words, Taney did not order the Army, or the commander at Fort McHenry (the named defendant in Ex parte Merryman), or the President, or anyone else to release Merryman from the Army’s prison. Now, perhaps the Army would not have obeyed any such a judicial order, but we will never know because Taney never issued one. Further interesting thoughts at the link. A Transition of Moral Cultures? What should the next President be like ? This is not the same as who the President should be. Richard Fernandez has some ideas on what he (or she) should be like. 1.An ability to face the facts, however unpleasant they may be. Yes, this is critical and we have had enough of liars and careerists. Is Trump a liar ? I don’t know. 2. An unswerving patriotism. This is not the same as a sincere feeling of love or empathy for America, though that is good. In this context it means the willingness to share the fate of the principals of which he is an agent. Yes, we are ruled these days by elites who do not plan to share any pain. This is unrealistic but they have been raised to believe they can avoid unpleasant reality. What do we do about this ? 3. Nerve. This is the quality of grace under pressure who no one, unless he has the misfortune to be tested, can be sure he possesses. Yes, the only real test is the reality and then it is too late. A few have tried to analyze this, and it is not easy. some individuals did not panic because their body naturally protected them. Unlike the majority of people who were flooded with a stress hormone, they had much lower levels and also showed signs of another hormone that actually calmed them down. He referred to Chesley Sullenberger, the pilot of the aeroplane that was successfully landed on the Hudson River in New York last month, as an example. “There are some individuals who when confronted with extreme stress their hormone profile is rather unique,” he said. “It doesn’t reach the same peak as the rest of us. So we’re all ready to scream in our chairs, but there are certain individuals who just don’t get as stressed. “Their stress hormones are lower and the peptides that down-regulate that stress are higher, so you can see in action the hormonal regular system really hitting overdrive. In his novel, Once an Eagle by Anton Myrer, the author was critical of men in combat who had no fear. They are abnormal and dangerous. Still, Hemingway defined courage as “Grace under Pressure,” and that implied that fear was still present. In the movie “Patton” an incident was described in which George S Patton Jr attacked three men who he believed to be kidnapping a woman. 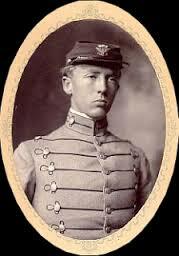 Does Trump look like the young Patton ? They seem to have similar expressions. My own life has been lived as a surgeon and there are surgeons who take beta blockers to deal with tremors caused by high levels of stress hormones. I have never had a problem with anxiety during surgery but, of course, I am not the one under the knife. 4. Intelligence. This is important, because it determines basic competence. But it surprisingly the least important attribute in this list. Intelligence, though rare, is not nearly as hard to find as the 3 characteristics above. You can find staffers who can give you intelligent advice. You cannot find staff to give you a character that you do not possess. This is so obvious that it should not need to be said but we are ruled by staffers. What do we make of all this ? I don’t know. Trump is an interesting character and I have no idea how he would function as president. I do think we might get a chance to find out. We should know more in a few weeks. I thought about this because I have been having an email exchange with a left-wing acquaintance of mine. My acquaintance thinks highly of Obama’s performance in office. Like many of us, my acquaintance has noticed an increase in racial animosity over the seven years of Obama’s presidency. My acquaintance attributes this increased racial tension to racists, presumably white, who “are driven practically insane at the thought of having a black president”. I am sure that there are such people. A quick tour of the Internet reveals plenty of racism to go around. And yet none of the many anti-Obama arguments I’ve read or heard has been based on race; conservative media are full of substantive arguments against Obama and his policies. Meanwhile Obama and his political allies have gone out of their way to racialize political controversies. And yet most of the Obama partisans I’ve met have been confident that white racism is the cause of most opposition to Obama. Apparently there are many people out there who believe that wet streets cause rain. I have been considering “disruption”, including what is hype and what is real. Here is one on the cab industry where it occurred and in the electric and gas utility industry which has proven resilient in its current business model. the sale of goods to the public in relatively small quantities for use or consumption rather than for resale. My experience with retail has been that of a consumer, although I live in an area near Michigan Avenue which features a huge variety of stores of all types, from mass market to high end “showcase” stores. I also have a long history with e-commerce, having been involved in a variety of businesses helping them to go “online” and “digital” from the earliest days of the web. Since the primary threat to modern retail today is from e-commerce, this experience is relevant. 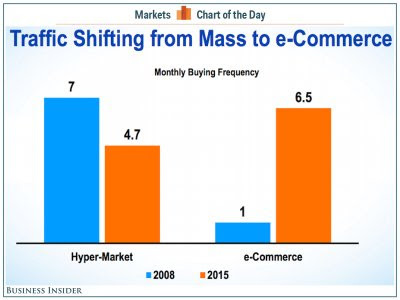 This chart above is from a recent Business Insider article on retail. The graph clearly shows how shopping is moving from the physical retailer to the online retailer, and it is being accelerated by the adoption of mobile technologies (which enable you to shop and research while on the move, not just when you are in front of your computer at a desk). But I don’t have any confidence that the Fox panel would have been smarter if its members understood the issue better. The real problem was that they didn’t come down in principle on the side of privacy. They could have at least expressed regret, or been reluctant about siding with the FBI. But they were slavering urgently for whatever measure the FBI demanded to get into Syed Farook’s iPhone – as if all our lives depended on giving law enforcement any privacy-busting capability it sees a need for. Technology doesn’t change the fact that this perspective is the opposite of the perspective of the Fourth Amendment. If our highest priority should be opening the people’s lives up to law enforcement, in case there are terror links lurking in our coupon drawers, then we should throw the Fourth Amendment out and require the people to all give the police keys to our homes, so it will be less of a hassle for them to get in whenever they declare a need to. Conservatives are supposed to be smarter than this. Let’s walk through it briefly to clarify why there is no need to bust the built-in security feature of the iPhone for the FBI’s general convenience. 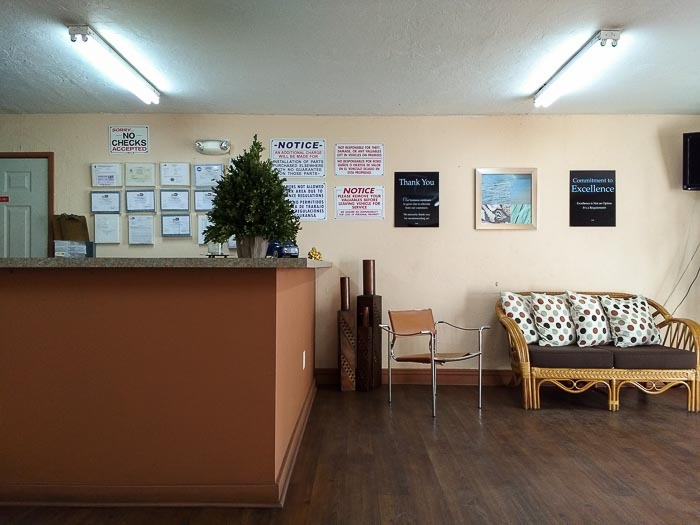 I read your February 18, 2016 letter to the Williams Community. I do not understand it. You don’t quote, link to, point to, or even summarize anything Derbyshire said or wrote. So the reader has no way to understand precisely what he said or wrote that crossed any “line” or even, when he said or wrote you allege constitutes hate speech. How is the reader supposed to understand your letter? 1) President Falk’s statement that “Free speech is a value I hold in extremely high regard” sounds a lot like “Your call is very important to us”. 2) Hate speech is speech. The reason why no one who expresses concern about “hate speech” ever mentions such a thing as “love speech” is that it’s obvious that speech that no one objects to requires no protection. The term “hate speech” is verbal camouflage used to obfuscate anti-free-speech arguments. 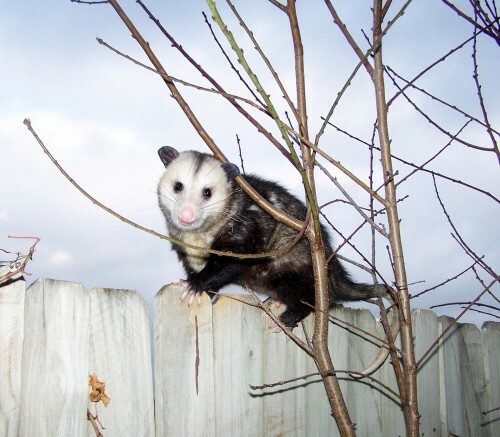 Smile, ‘Possum – you’re on candid camera! Still, it takes a lot to believe that Donald Trump could win more electoral-college votes than Hillary Clinton or Bernie Sanders and that his Supreme Court appointments would have Justice Scalia’s respect for the lives of his voters. Mr. Trump’s nominations for anything sit as a mystery. Before Justice Scalia’s death, some might have said the Trump option was a risk worth running. The risk now has become too high.